We’d love your help. Let us know what’s wrong with this preview of The Fifth Avenue Artists Society by Joy Callaway. To ask other readers questions about The Fifth Avenue Artists Society, please sign up. Going to do something I don't normally do and that is set a book aside at over 50% read. I found the premise interesting, an artist's salon in Manhattan during the Gilded Age. The writing is good too, loved the short glimpse of a young Edith Wharton and Oscar Wilde. The family, the four sisters bur seriously if I had to read one more scene with Charlie and Ginny and her constant facilitating between men and her moon struck passion for Charlie I was going to scream. Seriously. Historical Fiction is my favorite genre. Reading it can transport me to a time and place I cannot possibly experience anyplace other than books. When I saw the description and beautiful cover for The Fifth Avenue Artists Society, by Joy Callaway, I jumped and requested it from Edelweiss (my first approval from them!). I have very mixed feelings about this book. There were things I loved about it, but also I felt there were flaws that made it seem inauthentic. I did enjoy the setting Historical Fiction is my favorite genre. Reading it can transport me to a time and place I cannot possibly experience anyplace other than books. 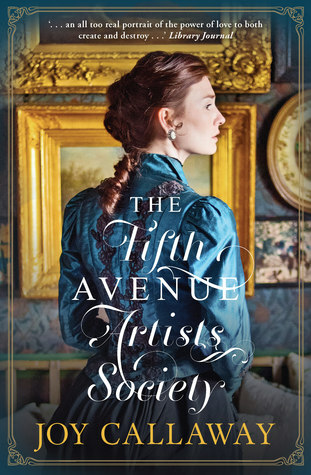 When I saw the description and beautiful cover for The Fifth Avenue Artists Society, by Joy Callaway, I jumped and requested it from Edelweiss (my first approval from them!). I have very mixed feelings about this book. There were things I loved about it, but also I felt there were flaws that made it seem inauthentic. I did enjoy the setting of 1890's New York. I thought that the author did a wonderful job of showing the hustle and bustle of the city and the varying degrees of living standards. While some people were enormously wealthy, others were freezing and starving just blocks away. I think it must have been terrible to be one of the "have nots" in this world. One could easily see the luxury some people had, and yet you might be struggling to have enough food for your children. The author also showed the immense disparity between men and women of that time. The main character is a budding author but is rejected time and time again because she is a woman. Her sister faces similar discrimination as a musician. She cannot join an orchestra due to her gender, even though she plays better than the men. When Ginny finds the Fifth Avenue Artists Society, a Friday evening gathering of male and female artists, she feels like has gone to heaven. Men and Women did not usually mingle so freely, plus men often regarded women's artistic endeavors as inferior. But at these gatherings, Ginny feels respected and thrives. The book is based on the author's ancestors. This is important to note because I think this is why most of the characters are not allowed to have any real faults. The author soft-peddles their flaws to the point that everyone has a good heart, even if they have done despicable things. Ginny, the main character, is hurting from being blind-sided with her childhood sweetheart marrying a different (and wealthy) girl. Yet, she still seems to love him. Her brother, Franklin, also makes some very bad choices, but since he would never intentionally hurt someone, all is forgiven. Ginny even gets mad at her family members when they become angry with Franklin. Although Franklin goes through a lot of difficulties, I thought he (and others) just weren't allowed to be actually bad people. I also thought Ginny continuing to love Charlie was problematic. Charlie visits Ginny and (and kisses her on the street in full view of the neighbors) despite being married. This would have caused a scandal in 1892. But there are no consequences for their open affection of each other. Also Ginny doesn't seem to feel bad that she is interfering in Charlie's marriage. I was waiting for a juicy confrontation between Ginny and Charlie's wife, Rachel. It would have been much more realistic if Rachel paid Ginny a little visit and told her to stay away from her husband. This would have given Ginny reason to pause and consider the implications of what she was doing. There were also several scenes where Ginny is getting very physical with men. She doesn't seem to feel any Victorian guilt or worry that she is being intimate without a ring on her finger. I thought this was out of place for the time period. Even if Ginny didn't feel guilty, there should have been some explanation in the book about her being a free spirit, or something else to account for her behavior. While I liked the setting and the story of struggling artistic sisters, I just felt that this book could have used more authentic personal dilemmas and been more honest about the darker side of the character's personalities. I was lucky enough to read a draft of this book. I can’t recommend it enough. It’s one of those books that will stick with me. Beautiful story and lovely writing. It’s timeless. The Fifth Avenue Artists Society is an enthralling glimpse into New York City literary and artistic society in the 1890’s. Virginia Loftin, an aspiring writer, is one of five children whose family has been struggling financially ever since their father died several years before. The family resides in the Bronx, and all but one of the siblings are artistic - a musician, two writers, and a milliner who designs outlandish creations for her many clients, including the Astors and the Vanderbilts. As The Fifth Avenue Artists Society is an enthralling glimpse into New York City literary and artistic society in the 1890’s. Virginia Loftin, an aspiring writer, is one of five children whose family has been struggling financially ever since their father died several years before. The family resides in the Bronx, and all but one of the siblings are artistic - a musician, two writers, and a milliner who designs outlandish creations for her many clients, including the Astors and the Vanderbilts. As the book opens, Virginia is jilted by the love of her life. As she struggles to overcome her grief and anger, she pours out her soul into her writing. To help distract her, her brother Franklin introduces her to a group of artists, musicians, and writers that meet frequently at the fictional John Hopper’s house on Fifth Avenue in Manhattan. As she becomes more involved with this group and its founder, she realizes that everything is not always as it seems. Joy Callaway does a wonderful job depicting the female role in society in the 1890’s. Both Virginia and her sister Alevia struggle to succeed in their respective fields because women were not yet viewed as anything but homemakers and in the wealthy set as the keeper of the social calendar and obligations. As they both begin to break through this barrier, they are then barred by society’s failure to look past a family scandal completely outside of their control. I never fail to be amazed at what earlier women endured to provide us with the freedom and choice we have today as females in the U.S. Some of my favorite parts of the novel were the appearances of Edith Wharton and Oscar Wilde at Hopper’s Fifth Avenue mansion. I also loved the descriptions of the early days of the great publishing houses like Henry Holt and G.P. Putnam’s Sons. The author clearly did her research which added tremendously to the novel. She also details at the end of the novel her inspiration for the story – her own ancestors. I felt that contributed a lot to the book also. My one complaint was that I felt that Virginia should have been a little less wishy-washy regarding her suitor situation. She vacillated too much for me. I also felt that her view towards her brother as later events unfold was not very realistic (I do not want to spoil part of the story by saying more). Thanks to HarperCollins for providing me this ARC in exchange for an honest review. I enjoyed reading it and recommend it as a fascinating view of New York City society and the arts in the 1890’s. So much more than I was expecting! This is going to blow everyone away. So weird. I loved the first half...a look into budding female writer in the 1890s and the artistic salon where she finds herself among peers while overcoming heartbreak and improving her writing. But then it delves into a weird murder and drug mystery and I just lost the tone of the novel. It just got so dark and weird and unappealing and I felt like all the characters lost their sparkle and wit. Wish it would have ended half way through the novel and I would have been very happy! This was incredible charming, I loved the feel of this, but Virginia was awfully annoying at times. This was a thoroughly enjoyable, very well written historic novel set in America 1891. Virginia is one of four sisters living at home with their widowed mother and while of genteel background struggling to make the bills. Virginia's twin is the only boy and while the women contribute to the household expenses, women do not earn as much or as easily in the 1890's as men do. Of the girls, there is a musician struggling to establish a career, another making her way through making hats, a teacher and This was a thoroughly enjoyable, very well written historic novel set in America 1891. Of the girls, there is a musician struggling to establish a career, another making her way through making hats, a teacher and Virginia who is a writer and has managed to get a job writing for a periodical. She dreams of writing a novel and after an introduction to the artists salon hosted by her brothers friend she grows as a writer and as a person. That description really does not do the novel justice, there were so many levels on which I liked it that it is hard to itemise them. Ultimately, the writing style and the characterisations won me over, but I really enjoyed reading the historical period in which it was set. I loved the period setting and I believed in it, while the women were contemporary enough to be likable, their situations rang true for me. There is a decent dollop of romance in there, more than a little mystery in one way or another and fun descriptions of literary Illuminati of the era - some of which I got, though I am sure I missed others. The only things I did not like are definitely spoilers (view spoiler)[ 1)I could not believe in the romance with Charlie, I tired, I just couldn't see it. And they ended up together.... Well, I did not hate the ending, but it was disappointing. I liked John much better, and found him more believable as a partner for Virginia. 2)Drugs? really? Americans are just embarrassingly obsessed with drugs being the evilnastybadguy. Kudos to the author for realising that the drugs in question were not illegal for the time, which puts it ahead of many American writers, but still. I read an early version of this and it is MAGICAL. This story immersed me into the world of four ambitious sisters navigating New York society during the Gilded Age. Wonderful historical details! I love that this novel is based on the author's own family history. got sucked in by a pretty cover and an interesting blurb. I'm not sure it's living up to my expectations. I really liked this book but towards the end it went in a direction I didn't care for. Virginia Loften knows one day she will be a famous author like her hero, Washington Irving, and her best friend Charlie will be a famous artist. She knows this as well as she knows one day she will marry Charlie. Ginny knows this with all the assurance of a seven year old girl. By the age of 22, Ginny and her sisters and brother Franklin are supporting their widowed mother with their artistic endeavors. Their father left them plenty of love but very little money. The Loftin siblings are happy th Virginia Loften knows one day she will be a famous author like her hero, Washington Irving, and her best friend Charlie will be a famous artist. She knows this as well as she knows one day she will marry Charlie. Ginny knows this with all the assurance of a seven year old girl. By the age of 22, Ginny and her sisters and brother Franklin are supporting their widowed mother with their artistic endeavors. Their father left them plenty of love but very little money. The Loftin siblings are happy though and willing to work hard at what they love, except for oldest sister Bess who believes she is a lady born and a lady she shall be. Ginny never dreamed her plans would be altered until Charlie proposes to another woman out of necessity. Ginny pours her anguish into writing a love story for the ages but is it good enough to publish? When her brother introduces her to his best friend John, a fellow writer, John invites them to his Fifth Avenue artists' salon where Ginny meets a number of artistic men and women. Among her new friends are Tom, a brooding writer and his sister Lydia, who is a special friend of Franklin's. These new friends encourage Ginny's literary efforts and help her on her road to publishing. Some of their comments sting, but she is willing to work to make it better. Then Charlie reenters her life and Ginny's feelings are confused. John cares for her deeply but what about Charlie? Then one night, shocking secrets are revealed that will change the Loftins lives forever. This is an Edith Wharton-esque drama set in Gilded Age New York. Edith makes a brief cameo in the novel, set before she became a famous writer. However, the writing doesn't live up to the promise of the story and in no way resembles Edith Wharton's style. Rich, poor, drama, passion, intrigue, romance, art- it has all the hallmarks of a PBS Masterpiece drama. Ginny tells her story but doesn't allow the reader to become fully engaged with her. She tells us how much she loves Charlie and how much he has broken her heart, etc. etc. She tells us she shut herself up to work on her novel and tells us everything else. All that telling makes the first half of the book very very slow and doesn't really allow the reader to become integrated into the story. The period details aren't bad but the characters spend a lot of time discussing whether a husband would allow them to pursue their art. That's one thing that keeps coming back over and over and gets tiring after awhile. Just seeing one married character and her interactions with her husband was enough to get the characters wondering and show the reader what they were thinking. The epilogue was weird and unnecessary. The plot is intriguing. I could have cared less about the romantic entanglements but I wanted to know what happened. The plot picks up halfway through and I was mildly interested in whether Ginny would become published so soon. Then BAM - a shocking plot twist and the book became difficult to put down. I had to skip ahead to find out what happened. One of the secrets is very very shocking and completely crazy by our standards. I wasn't totally surprised- there were clues but how it all went down and to whom was the real shocker. There was another secret that wasn't a huge surprise at all. There was a big clue and Ginny, as Franklin's twin, should have known. Ginny claims Frank is her best friend and they're supposed to be twins but that relationship gets dropped in the middle and by the time the drama happens, it seems like they're just siblings who don't know each other well. I thought twins would be able to sense when one is in trouble or something- at least in a story like this one. This plot twist made the story a little too dark for me. The characters were largely unlikable. Ginny's manner of telling the story didn't really endear me to her and her reactions and interactions with other characters just didn't make her appealing. I wanted to like her because I thought she would be like Jo March, one of my favorite literary heroines, but she's not. The Loftin sibling I hated the most was Bess. She and Ginny didn't get along and I didn't care for Bess for the same reasons Ginny didn't. I liked Mae the best because she had a passion, drive and still managed to be compassionate and caring towards her family. I also liked Alevia and her deep passion for music and lack of interest in marriage. I just thought it was a little strange how she was so obsessed with music and didn't do or think of much else. I had some compassion for Charlie in the beginning but he turned into a selfish idiot and I didn't want him to succeed with Ginny. I didn't like Tom but he didn't deserve Ginny's rudeness. I didn't get that he was any more or less arrogant than any other artist at the salon. Lydia got on my nerves and I felt John was insincere and too dramatic. The story is loosely based on the author's family history and would have made a better biography. The plot was a little too dark and dramatic for my personal taste. First, a warning: I had things "to do" today; I intended to read just a chapter, maybe three -- but once I started this novel, I couldn't put it down. The book opens with a familiar scenario: girl loves boy, boy proposes marriage to someone else. This problem of unrequited love --or, perhaps more accurately, unsatisfied love -- frames the narrative but does not serve as the central tension for the novel. The book's protagonist deals with more complex, though still universal issues -- family strif First, a warning: I had things "to do" today; I intended to read just a chapter, maybe three -- but once I started this novel, I couldn't put it down. The book opens with a familiar scenario: girl loves boy, boy proposes marriage to someone else. This problem of unrequited love --or, perhaps more accurately, unsatisfied love -- frames the narrative but does not serve as the central tension for the novel. The book's protagonist deals with more complex, though still universal issues -- family strife, class warfare, drug culture, gender inequality, just to name a few. I was drawn in by the layered conflicts in the book, but I could have just as easily fallen in love with the book based upon the writing alone -- the prose is gorgeous, packed with images that transport you back to 19th century New York. I felt like I was immersed in an American Midnight in Paris. The book, too, becomes all the more fascinating after reading the author's note at the conclusion of the novel: the book is based upon the author's artist ancestors and their histories. Truly, this book was a gift to read -- well worth clearing an afternoon for! I received this book from a Goodreads giveaway for an honest review. Set in the late 1800s in NYC, the story focuses on a family of artists. Having lost their father, each of the children must do their part to support the family. Told through the voice of Virginia, "Ginny", a writer with lofty dreams of being a published novelist. The novel begins with Ginny being jilted by Charlie, a boy she grew up with and was passionately in love with. Trying to overcome her broken heart she begins to visit J I received this book from a Goodreads giveaway for an honest review. Set in the late 1800s in NYC, the story focuses on a family of artists. Having lost their father, each of the children must do their part to support the family. Told through the voice of Virginia, "Ginny", a writer with lofty dreams of being a published novelist. The novel begins with Ginny being jilted by Charlie, a boy she grew up with and was passionately in love with. Trying to overcome her broken heart she begins to visit John Harper's home on Fifth Ave. to socialize with upcoming artists, musicians and writers. While I appreciated the glimpse into the struggles of a woman trying to make a name for themselves in a man's world, the first half of the book dragged for me. Fortunately the second half of the book had more demension, development and conflict, making the story more satisfying. Joy Callaway's prose spins a historical tale but maintains a modern feel that gives a reader a sense of timeless beauty. This is a wonderfully written story that pulls you in from the beginning and holds you tight all the way to the end with sensible, believable characters inspired by the author's ancestors, a whimsical writing voice, and an always intriguing plot. ***I read an early draft of this novel and fell in love. I liked the concept and the setting of this book and many of the characters were interesting, the problem was with the main characters, I think. Ginnie never really comes off the page like her siblings do. The post-Charlie love interest too seems wooden. I think there is a lot of lost potential here that never gets well-developed. 3 -stars, if we could do that here. this was a good escapist read for me. there were some things that niggled at me a bit, but i was fairly transported by the era, characters, and settings to still really enjoy this story. 3 ½-stars, if we could do that here. this book left a mark on my heart. can't decide whether it's a 4/4.5 star read. but gonna be recommending this to a lot of my pals now. I had a difficult time getting into this book; it finally got interesting about half way through. The story line appealed to me; a place where talented people interested in writing, painting and music could come together to share their ideas. This was done in Paris but not in New York. The time was the late 1800's after the Civil War and a time when life was moving on. Young Ginny her brother Frank and the neighbor, Charlie grew up together in the Bronx. Ginny was the writer and Charlie the artist. I had a difficult time getting into this book; it finally got interesting about half way through. Young Ginny her brother Frank and the neighbor, Charlie grew up together in the Bronx. Ginny was the writer and Charlie the artist. Frank sometimes dabble in art but he was out to make a fortune for his mother and sisters. Ginny always loved Charlie and though right up to the moment he proposed to another girl that they would some day marry. Needless to say her heart is broken! I received a copy of this title from Allen & Unwin for review. Virginia is a writer and in love with Charlie, the boy next door, but he proposes to another. I could have probably found myself enjoying this if I didn’t have a whole bunch of books lying around waiting to be read, honestly, but overall this one was a bit too out-of-period for me. I prefer my historical fiction from this era to be British rather than American. There were a few turns I received a copy of this title from Allen & Unwin for review. I could have probably found myself enjoying this if I didn’t have a whole bunch of books lying around waiting to be read, honestly, but overall this one was a bit too out-of-period for me. I prefer my historical fiction from this era to be British rather than American. There were a few turns of phrase in the dialogue and in the general writing that hit me as slightly out of place, but again, if I was an ordinary reader who read one book at a time, I may have found more to enjoy here. This one is a victim of just not being my thing. But it might be yours! This is very reminiscent of Little Women with the tale's core focused on the siblings, their dreams, disappointments, love affairs, victories, and failures. Towards the last third the story took a dark and tragic twist that devastated everyone. It's the ending that I didn't love. It's not bad, it's very realistic actually, the resolution is so true to human nature and if I were caught in the same situation, I think it would play out close to how it happened here. Yet as this is fiction, I was hoping for full closure. The Fifth Avenue Artists Society is a good historical fiction with lots of surprises to keep it interesting. The writing was very good. I'm impressed that the story was inspired by the author's own ancestors. I enjoyed seeing the world through the perspective of a female writer living in the Bronx in the late 1800s. Great story! I found myself a little annoyed with the main character at times, but that was because she was well written. Interesting enough to make me start searching for more details about this particular era and some of the situations the characters experienced. Lots of nice details allowed me to build a great mental picture of the various settings and the people themselves.